Steve Salmons was a rare player who led his teams to championship at all levels. As the LA’s City Player of the Year for Pacific Palisades HS, Pali won the 1st ever HS Southern California Regional Championship. Then as College Player of the Year in 1979 (over Sinjin Smith and Karch Kiraly), the Bruins became the first unbeaten team in college VB history winning the NCAA title over USC. 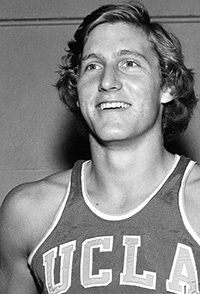 Then after missing almost his entire 1981 senior season from a back injury suffered while playing for the US at Pan American Games, he returned for post-season play to lead UCLA to another NCAA title and was named to NCAA All-Tournament for the third time, while being a three-time All American. He won 2 USVBA crowns and was selected All-American. The USA Jr. National team to it first ever Pacific Rim Tournament Gold Medal where he was MVP as starting middle blocker. From 1978-1986 he was a key member of USA National Team, and went on to help the USA to win it first volleyball triple crown with gold medals at the 1984 Olympics in Long Beach, 1985 World Cup in Japan and 1986 World Championship in France. He was named to the All-Century volleyball team by ‘Volleyball Magazine’ and inducted into the UCLA Athletic Hall of Fame in 2000. On the beach he won professional four-man tournaments and international double events. His daughter Alexis played Volleyball for St. Mary’s College and his son Reece played for the UCLA Men’s Volleyball team.